Brunnenthal Botanic Path : Erected in 1796, the Jewish graveyard ofPhalsbourg constitutes the start of this about four-kilometer-long circular path, which is easy to follow as it winds through the Brunnenthal, a valley (Thal) rich in springs (Brunnen). Quite a lot of wash houses embellish this valley and, at the end of the course, the beautiful Brunnenthal wash house, which was restored in 1998, greets your eyes. A second wash house, the Bossele wash house, was restored in 2001 and, at the end of the path, carved in the trunk of a huge spruce that was topped by the storm of December 26th 1999, the Fairy of the Forest watches over the Brunnenthal. The Hermit's House, a good soul's haven of peace at the very beginning of the twentieth century will be restored during the year 2002. 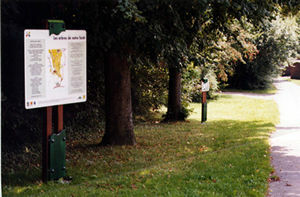 About thirty richly illustrated notice boards will make you discover the main species of trees in the Northern Vosges forest in a humorous way.